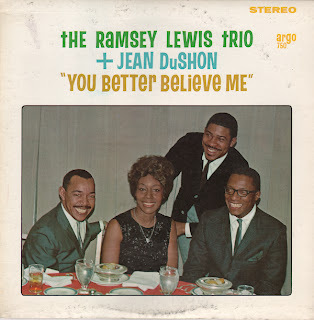 This is a split album, featuring DuShon on side one with Ramsey Lewis -piano, Eldee Young - bass, Red Holt - drums, Ronald Wilson - alto saxophone - flute and Roland Faulkner, guitar. 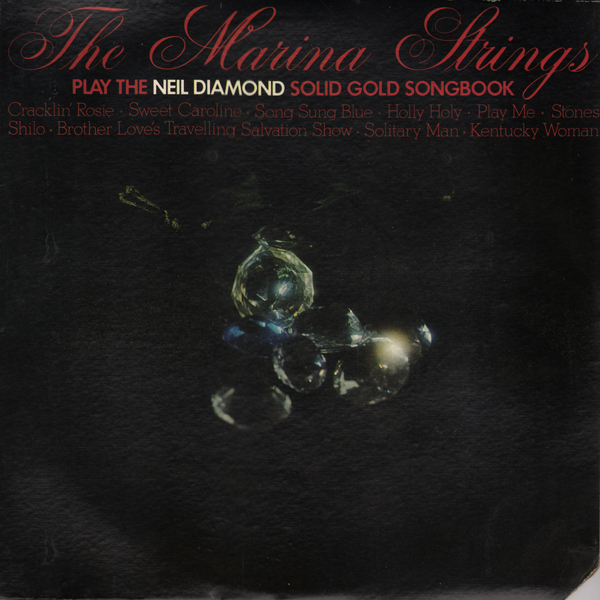 And side two featuring just the trio performing instrumentals. From the back cover: Jean DeShon is making her second recorded appearance on ARGO. Her first album, which rapidly drew rave reviews and many plays from disc jockeys throughout the country, was recorded last summer. This album can only help to add to the well-deserved praise and recognition that her first ARGO effort won for her. 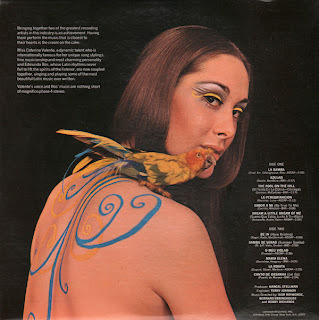 I was drawn to the cover photo which struck me as curiously informal. Whether planned, or not, the vibe one side one also sounds "informal" which could be due to how the recording was engineered. The album was recorded at Universal Recording Studio, Chicago, Illinois, on December 19, 1964 and January 14, 1965). 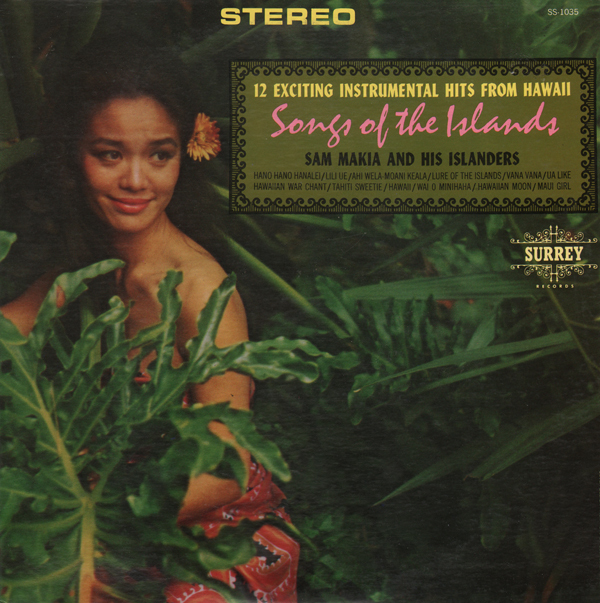 Here is another album, Hawaii The Fabulous Fiftieth State, featuring the artist "Sam Makia" in association with Frank Hunter. The tunes blend pop influenced passages with the traditional pedal steel island vibe. 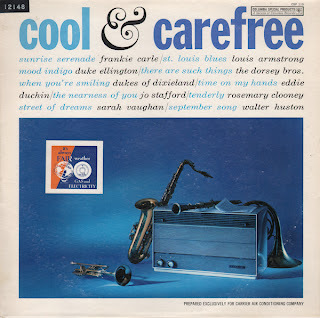 There is a nice collection of tracks to be heard on this promotional release from Carrier. I enjoy Ros albums. 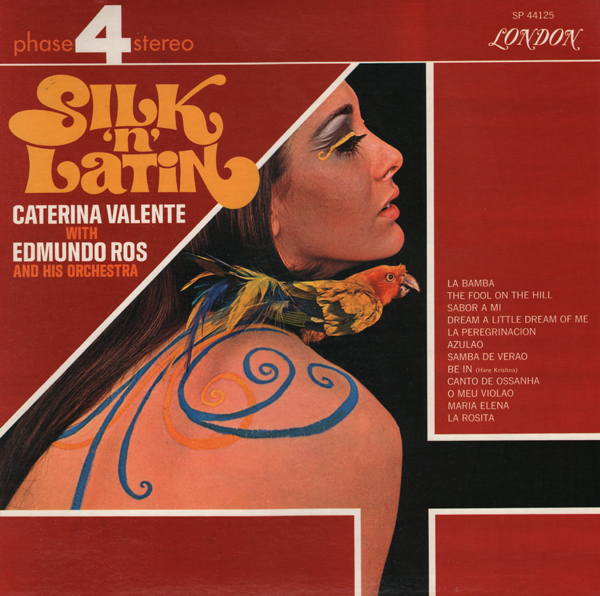 The album formula is very often light pop/Latin instrumental along with several vocal numbers by Ros. In this case, the album is heavier on the light pop vibe and all vocal, of course featuring Valente. The sound is fresh and interesting all the way through. Enjoy the samples recorded from a sealed copy I found. I can't confirm, but I think the cover model is Valente. Valente recorded with Ros at least once and before this release on a Brazilian LP titled Caterina Valente com Edmundo Ros. The jacket is an elaborate book-fold production. 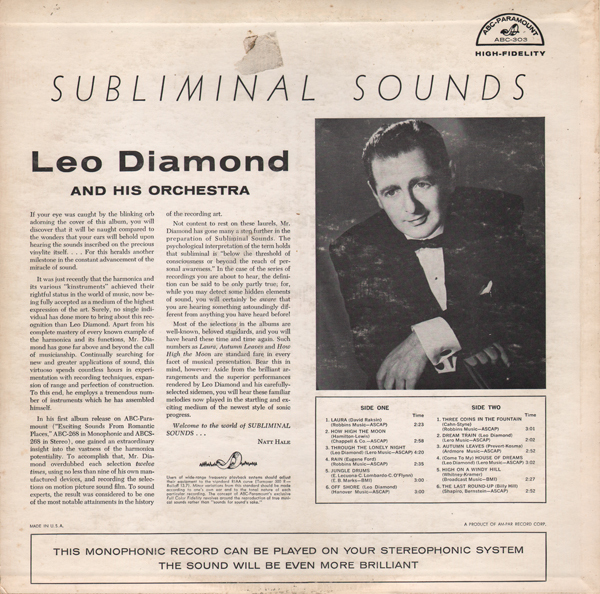 The record label itself is marked, "Deluxe Series". This release could have been the run-up to Liberty's Premier Series of gatefold jackets. From the inside cover: During his years that Colonna played with the staff orchestra at CBS, he was considered to be one of the five top trombonists in the country. 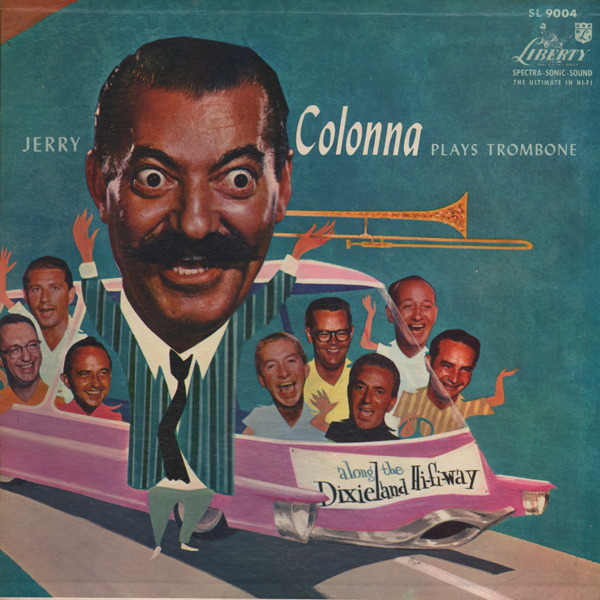 From Billboard December 22, 1956: Comedian Colonna, a trombone man with a number of name bands before his original emergence as a comic, gets back to music here in the company of Matty Matlock, Nick Fatool, Eddie Miller, Clyde Hurley and others known collectively as the Dixie Highwaymen. The 16 tunes are not particularly familiar to the idiom, but don't discount the fact that this is very easy listening Dixie. The playing is clean and sharp and it swings in a nice but unobtrusive style. The package is a de lux job in a four fold cover. 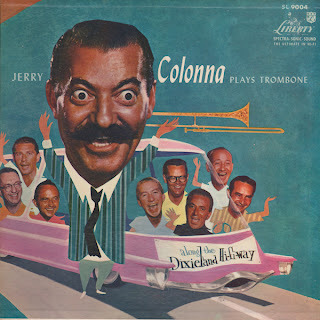 It deejays give this a break it could overcome the common impression of Colonna as a funny man and help sell him on a music kick. This one is available for purchase/download so I won't be posting a sample. Sorry! The single reviewer claimed to be a May fan then proceeded to say: "It's just awful in every way..."
Not every way! 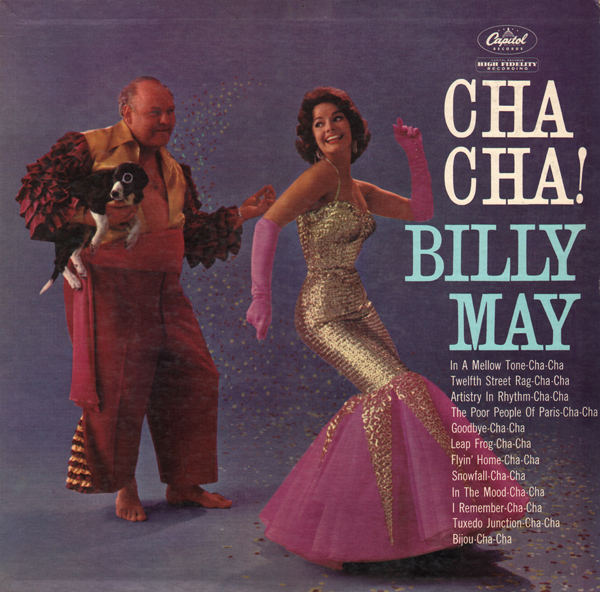 May is dancing on the cover dressed up in a cartoon Latin get-up that allows his chest hair to peak through. And you get a super hot sparkly lady. Oh, and May is holding a damn dog for God's sake! Why a dog? I don't know. 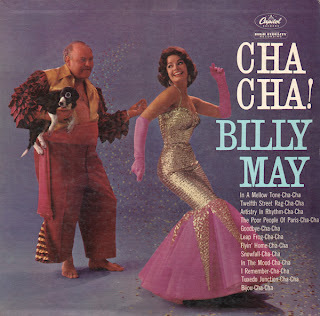 The cover art ought to be worth a few stars don't you think? From Billboard September 7, 1959: Harmonica artist Leo Diamond – also an expert in the recording art – has put together a beautifully done package of standards. Album cover includes one of those magical blinking orbs, which, with the album title, lends a touch of mystery to the contents. The performances are really fine, and include "Laura," "Off Shore" and "Jungle Drums." 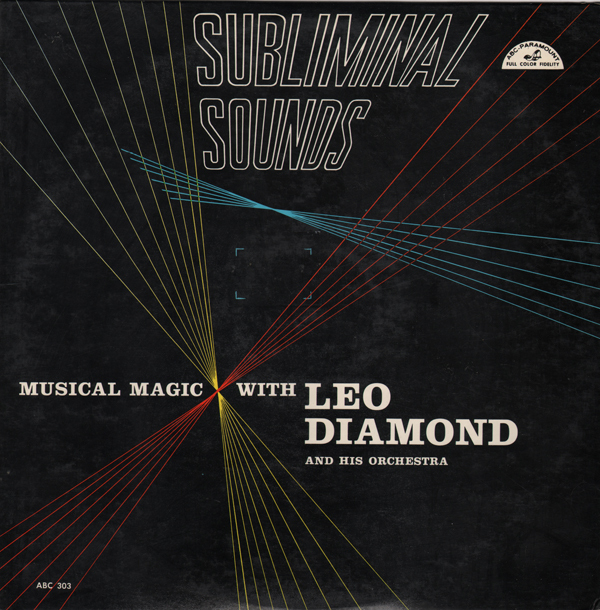 From the back cover: Mr. Diamond has gone far above and beyond the call of musicianship. Continually searching for new and greater applications of sound, this virtuoso spends countless hours in experimentation with recording techniques, expansion of range and perfection of construction. To this end, he employs a tremendous number of instruments which he has assembled himself. Oh well... not to worry... I've still got the great music to enjoy. OK OK... I want the blinking eye cover! 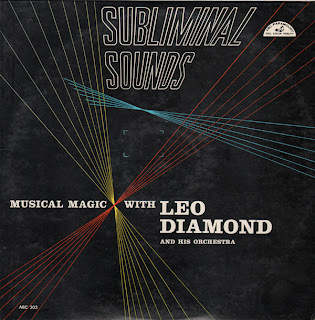 Until I find a blinking eye cover, enjoy a sample from one of Diamond's best albums.